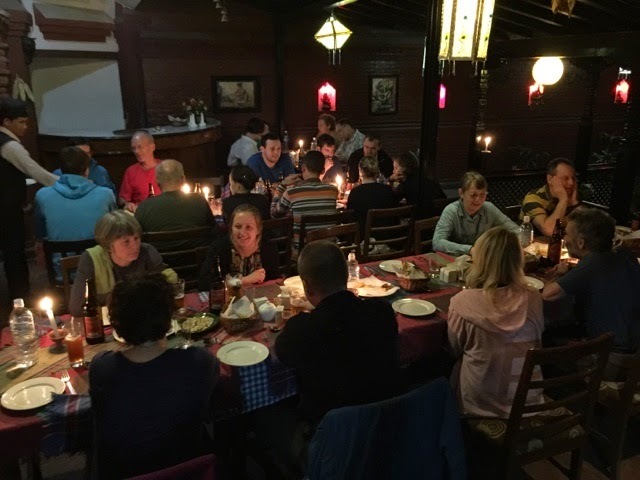 There are now four groups on the Manaslu trail with Group 4 surviving after their first camp, first day of trekking, and the first 24hours of superbly cooked food by the busy kitchen staff. Group 2 have rallied together and progressed to their next camp at Jagar. All groups have been in contact with one another via sat phone or mobile, but not quite with the radio. That means that the wonderful messages that have come in clearly by Iridium haven't all been yet dispersed. Let's hope we all make contact tonight! Thanks to everyone that has sent them in, they are a real morale boost. And so far the winner goes to Saskia's family! Keep them coming. Group 3 have succumbed to sweating buckets as they trotted on up the valley pass. Again dodging the numerous mules and their droppings which have become the standard odour of Nepal so far. A few members have visited the toilet a few too many times, hopefully our stomachs will acclimatise soon. Another beautiful view from another campsite this afternoon. Neil has even had a chance of an afternoon nap without any umbrellas or other commodities to repair. A handful of Group 3 members paddled in the cooling river whilst one mad one jumped right in...guess who?! How quickly things can change. Our lazy afternoon ended with a massive thunderstorm and high winds. The Sherpa staff worked so hard to keep the tents safe in the howling winds and torrential rain. Then we received the terrible news that a member of group 2 had slipped in the storm and fallen some distance down the valley side, sustaining a nasty head injury. Group 2 Sherpa staff and Medex members were able to stretcher her to the village medical centre and 5 Medex doctors cared for her. Thanks to modern technology her husband was informed and has been kept updated on her recovery. After many phone calls she was successfully evacuated to a Kathmandu hospital first thing this morning and is well on the road to recovery. 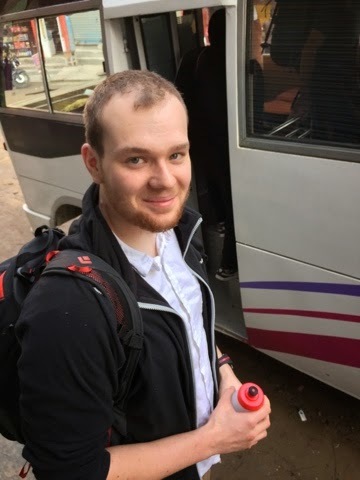 Group 1 are making good progress and have continued their trek from Jagat to Pewa. Group 2 have chosen to have a rest day in Machha Khola to recover from the nights events. Group 3 have continued up the gorge in beautiful weather, following a path which hugs the hillside, with climbs up and down into several side valleys. the views have been wonderful, with the river raging below, steep terraced fields and increasingly remote villages. We managed to avoid the long trains of pack mules descending the track and the naughty monkeys knocking stones onto passers by. Our campsite tonight is beside a very 'modern' tea house / hotel with 'Western toilet' and shower! And to our surprise, the baggage we saw leaving on porters backs arrived in camp on a brightly decorated, bell ringing mule train. We are off! What a way to start the day. First the bed tea arrives and we record our oxygen saturation and pulse rate before we are allowed to get up. Then the wash water arrives and we scuttle to the scales in thermals for our daily weigh in. After a breakfast of cereal, boiled eggs, toast and lots of tea we set off along the trail. Our route has taken us along Arughat "high street", already with tiny shops selling everything from water containers to lumps of meat. Then we continued upstream, following the dusty road through rice paddy fields, wheat, sweetcorn and small, sweet bananas. The valley is hot and humid, so dousing heads under running water was a great way to cool off. We've been treated to an easy day, arriving at our campsite for a late lunch. Time to rest, read, recce the village. After lunch a vicious thunder storm ripped in with gusty winds and lashing rain. By then we were safely in our tents. We camped tonight in the yard of the Hotel Manaslu at Arughat about 30m above the West Bank of the river. The evening was hot and sweaty with spots of rain and the odd mosquito. Our Sherpa and porter crews were introduced to everyone after dinner. We leave at 8 in the morning with our 11 strong sherpa team and about 20 porters. Tomorrow will be a short day but very hot. Two groups are ahead of us and there will be two more behind us. Quite an army moving up the valley! In addition research loads and re-supply to Base camp clockwise via Bimtang. 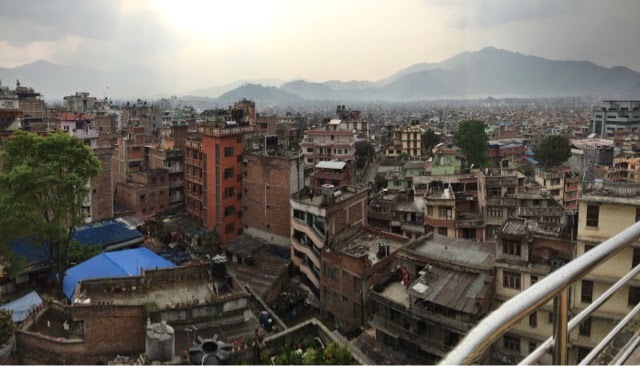 Group 3 and our Sherpa crew left Kathmandu at about 9am and drove through the congested streets serenaded by a chorus of screaming horns. As we left the suburbs the road switch backed steeply down into the Trisuli Valley. Nightmares overtaking on precarious roads with the odd truck hanging over the abyss having misjudged its width. Tea beak on the banks of the Trisuli before crossing the river and following a winding Tarmac road through the terraced hill sides. At about 700m we took a left fork and the it was dirt roads winding up a steep hill side of prosperous terraces no lunch at a small village on a ridge at 1100m. After dhal baht we descended down through rhododendron forests and finally down to the bridge over the Buri Gandaki to camp at Arughat 534m. 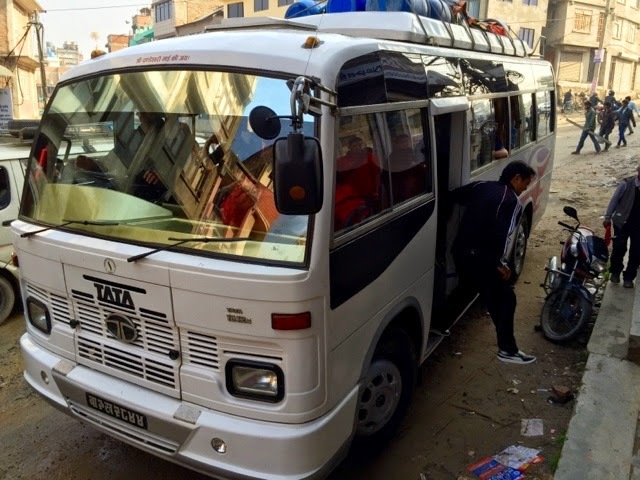 Nepalese buses now have wifi! Group 2 posted this back to Facebook this morning! Group 2 left for Arughat at 0830 today. It is only 61km in a straight line but they will have a long and rough bus journey. They should be in camp by mid afternoon. Group 1 started walking today from Arughat. They are said to be making 'good progress'. Last night Sally and I went to Furba's house for a wonderful dinner with Furba and his wife. His younger brothers also joined us. Best momos ever and it was lovely to meet the family. Many thanks. Guillaume Walther, one of our team of French physiologists, has produced a couple of short films about the Expedition. 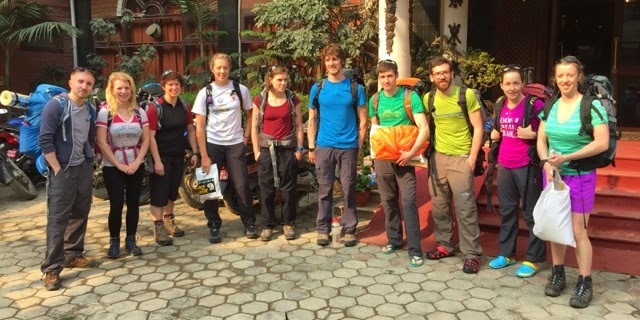 The twelve members of Group 1 just left Kathmandu accompanied by Sarah who is travelling ahead of her group to establish the Porter Wellfare Project at the start of the trail. 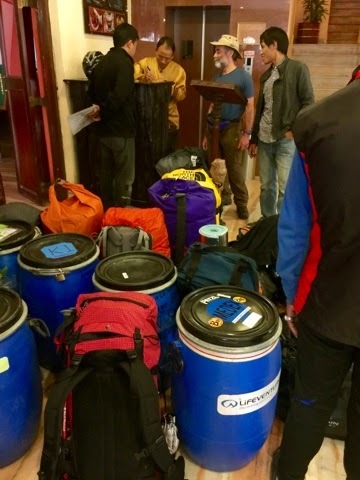 All the equipment had to be re-weighed to make sure that enough porters are on hand to carry it around the 28 day trek. They have a seven or eight hour bus ride to the start of the trail so will camp at the road head tonight. The first part of the journey is on sealed roads but after that it is single track, unsealed roads. 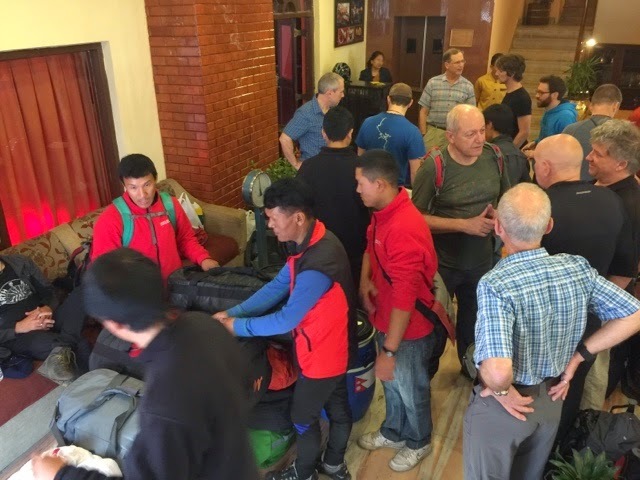 The numbers are swelling now in Kathmandu as more members arrive from UK, France, America, New Zealand, Germany, Spain and Holland. More meals and celebrations. First group leaves for the hills in 2 hours. All the provisions and equipment is now packed and ready to go. 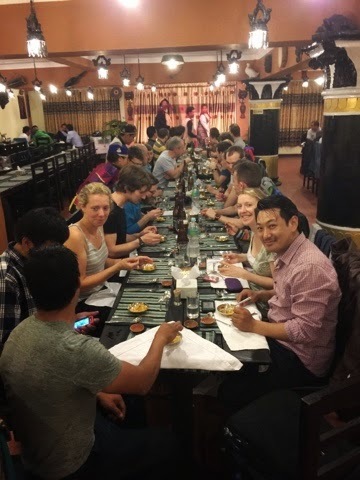 Half the team have now arrived in Kathmandu and those that are there celebrated at the Kathmandu Grill. Everyone's luggage is now here with only a few minor delays thus far. 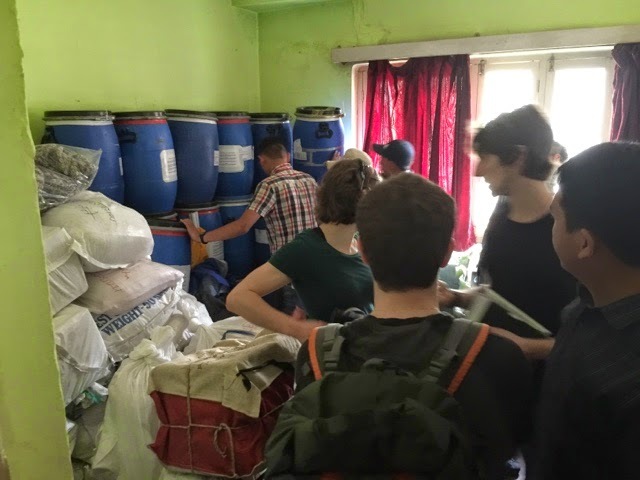 Three members of the Expedition are now in Nepal getting everything ready for the rest of us. 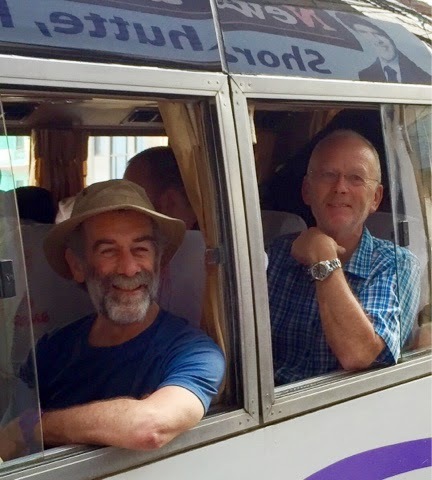 Denzil Broadhurst, David Wyatt and Andy Taylor will be sourcing some supplies locally and making sure that the various items of Expedition gear head off in the right direction at the right time. Thanks to everyone who sent us scans of their passports at short notice. 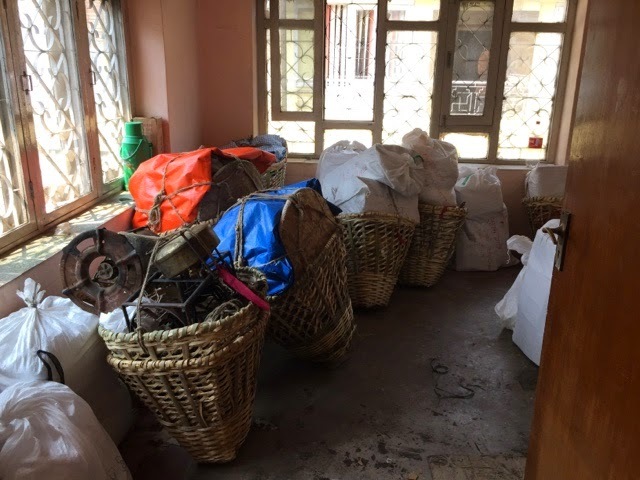 Furba was able to use these to extract our freight from Customs and all 670kg of equipment are now safely lodged in his compound. We have now had our satellite phone number issued so that the outside world can contact us if they wish. This can be done free of charge by sending an Iridium web message from the Iridium website. Each message can be up to 160 characters. If friends and family of members wish to contact anyone then we will be happy to receive these messages on a daily basis and pass them onto the intended recipient. If the IT works we will be posting back to this blog via the satellite phone.